On this page you will find a collection of valuable books on the topics of resistors, electronic components and electronic design in general. 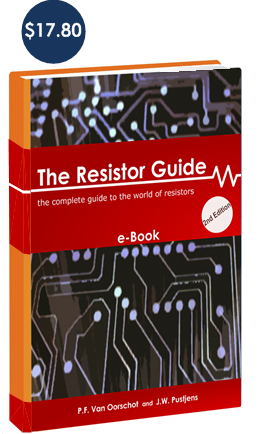 The most up to date resistor book, written by the founder of Vishay. The book gives an overview of the design, use and production of resistors. 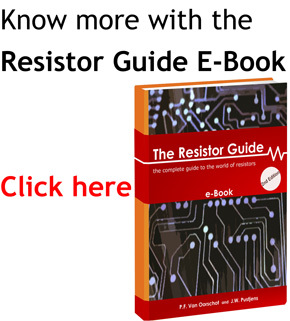 A good in-depth reference resistor book. It describes the fundamentals of composition, film, foil, wirewound and shunt resistors as well as NTC and PTC thermistors. If you need to learn how to protect circuits from overvoltages this book is interesting for you. The author clearly has experience in designing overvoltage protection, which is the main application of varistors. A more fundamental book on electroceramics, the building blocks of varistors. Electronic component encyclopedia that describe all commonly used components in a clear way. All components are illustrated with drawings and pictures making it easy to find information in this book. Electronic component reference book, including passive and active components as well as wire and solder. A practical approach to learning electronics, a great resource to start learning electronics with a hands-on approach and a lot of interesting experiments. A good book to learn the basics of electricity and electronics. The fundamentals are explained in easy to understand language, this is supported by step-by-step projects to help getting a better understanding. Authoritative textbook and reference on electronic design. Extensive textbook that combines the fundamentals of analog and digital circuitry. The book supports the circuits and electronics course on MIT OpenCourseWare. An in-depth book on electric noise, it’s sources and models. Gives clear guidance on how to design low noise microelectronic circuits. This book by a professional audio equipment designer gives you great information on how to design small signal, low noise analog equipment, in ways that do not have to cost much.